The three candidates for Hong Kong chief executive faced off in a final debate Monday, ostensibly to discuss property in Hong Kong. The two top candidates, Henry Tang (above middle) and Leung Chun-ying (above left), traded barbs, and Tang even accused Leung of defamation, a somewhat puzzling development in the topsy-turvy race. The race, once Tang’s to lose, is now a toss-up — the 1200-member Elections Committee makes its decision Sunday. Although Hong Kong’s business elite have long preferred Tang, leaders in the People’s Republic of China have indicated some ambivalence about Tang as he’s become more embroiled in scandals. Some observers believe remarks last week from Chinese premier Wen Jiabao show an unmistakable tilt toward Leung, who is by far the most popular choice among the Hong Kong populace. 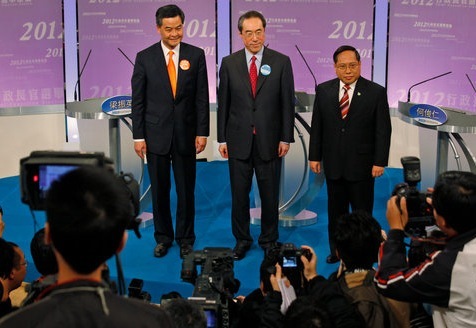 An instant poll following the debate showed that viewers thought Tang performed the worst, behind Leung and pro-democracy candidate Albert Ho (above right).